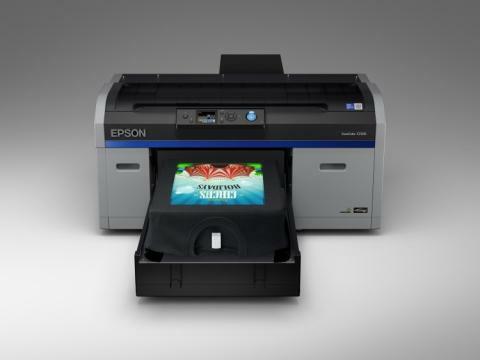 Epson, a leader in professional printing, has announced the launch of the new SureColor F2130 Direct-to-Garment (DTG) printer that has an enhanced design and improved usability, enabling faster turnaround time for print jobs and better productivity for the business. The SC-F2130 printer will replace the existing SC-F2000 model and will help to lower costs with improved speeds and reliability. The new SC-F2130 DTG printer is driven by Epson’s proprietary PrecisionCore Thin Film Piezo printhead delivering fast production speeds at outstanding clarity and sharpness on textiles, at resolutions of up to 1,440 x 1,440 dpi, and is one of the fastest direct-to-garment printers in its class. Users can print and dispatch completed garments in as fast as 27 seconds. The Epson Garment Creator software has also been re-designed with usability and intuitiveness as key, to enhance the workflow of the printing process. Users can save predefined colour management and layout control presets for ease of use. Designed for convenience in calculations of costings, users can get cost estimates before a job is sent to print. The control panel has an improved interface that provides overview of settings and consumable levels to monitor ink usage, showing information on thumbnail preview, fabric wiper level, platen size, t-shirt colour for printing and more. The printer’s physical structure has also been enhanced for productivity. The platen gap has been refined to 0.5mm, enabling finer height adjustments for better and finer print out. It comes with a new platen grip pad that does not require a frame the secure the garment in place, cutting down on the printing processes. It also has improved serviceability with improvements to the mechanical design – with fewer parts to remove to access the rear.